Throughout history, Japan has launched a number of invasions of Korea. The most recent one began early January 2004. Unlike previous military campaigns, the invasion of 2004 is definitely more of a cultural one. The South Korean government decided to allow more imports from Japan, including CDs and video games. One of the first items made for the market is Kick the Can Crew's Good Music. Hot on the heels of a new Best of album, the hip-hop trio's latest outing was released earlier in Korea (January 1st, the first day that the new imports were allowed in) than in Japan, and the group has made much of it; one of the videos for the singles had Kick the Can Crew in a very Korean setting. For fans of the group, there isn't much new here; Good Music doesn't dabble in many styles and formats, unlike their earlier albums, such as Magic Number and Young Kings. Additionally, nearly half of the album had already been released in Japan as singles throughout the fall and winter of 2003. On top of that, many of the unreleased tracks aren't even full songs. 01. Opening: Like earlier albums, Good Music begins with a simplistic opening track. The electronic beats and upbeat hip-hop vocals set the mood for the entire CD. 02. Sei Continue: "Sei Continue" was released in 2003 as a single. The track is very upbeat, with a sampling of brass horns throughout the track and it sounds great. As mentioned above, the CD breaks little new ground and "Sei Continue" is pretty firmly in the mold of previous Kick the Can Crew songs, but the upbeat vocal chorus adds another dimension to the song. 03. Parade: Another conceit through the CD is a female vocal offering commentary, and it's pretty well introduced on this track (Ee, nani sore baka ja nai no?). Light on actual hooks and melodies (there is one, but it's not overpowering, like in "Sei Continue"), "Parade" is more about the bass, which heavily uses Indian/Japanese drums. 04. Mission 1: One of the CD's "Mission" tracks, these are shorter (but no less catchy) tracks on the CD, which all share the same hook/beats. "Mission 1" comes in at 1:13", but the hook is pretty good and is reminiscent of the slower tracks on Young Kings. 05. Nounai Vacation (Album Edit): "Nounai Vacation" too has already been released as a single in Japan. Compared to the high energy tracks before this one (even the vocals in "Mission 1" packed a punch), this is more of a breathing track that recalls some of the later tracks on Magic Number. The chorus' synth hook sounds almost like something out of an 80s anime. 06. All Night Long: If "Nounai Vacation" had a slight tinge of 80s dorama or family anime, then "All Night Long" is infected with the funk of the 70s, not unlike one of the group's previous tracks, "X-amount". Featuring a horn-laden hook that wouldn't be out of place in Disco Stu's record collection and some heavy bass, this is definitely one for the dance floor. This seems like the weakest track on the CD, however, as the chorus is somewhat goofy. While many Kick the Can Crew tracks are silly, they never sound goofy, but "All Night Long" is bizarre, if not downright goofy. 07. Uraomote: In earlier albums, Kick the Can Crew explored diverse genres, from jazz to bossa nova to electronica in a hip-hop context. While Good Music doesn't have the breadth of previous albums (it primarily concentrates on a pop-electronica sound), "Uraomote" has a very jazz feel thanks to its hook, which sounds like it was lifted like a lego right out of a jazz piece. The track also has some of the group's characteristic silly lyrical rhymes and puns. 08. Yure: Continuing on the theme, "Yure" is reminiscent of 70s R&B. A slower track on the CD, the hook seems much less omnipresent than those of other tracks on this CD. 09. Mission 2: Pretty close to "Mission 1" both in beats and in length, track 9 seems a bit more like filler than anything else. 10. Jiyuu Time (Album Edit): "Jiyuu Time" continues the slower pace of "Yure" with an infectious jazz/vocal hook. For once, the trio's vocals seem to take a backseat (or at least a passenger seat) to the hook. The vocal harmonies at the end of the track are great, but the hook definitely steals the show. 11. Nabi: Another single (it came out with "Yure" about a month and a half before this album), "Nabi" (short for "navigator") is another upbeat, almost sunny track along the lines of "Nounai Vacation", with a guitar based hook and the silly lyrics. It's a good contrast with "Yure", probably the reason that they came out together. 12. Like This: "Like This" uses more hip-hop samples for its hook. It doesn't have any real vocals and it is pretty short, at a 1:14". 13. 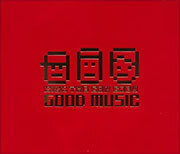 Good Music: One the earliest singles from this CD ("Panku Sunzen no Funk" was the first), "Good Music" was markedly different from Kick the Can Crew's back catalog when it came out, but it fits in well on this CD. The guitar and lighter bass sound less like a loop of samples and more like a complete song. When it came out, it was especially surprising, as it was very different from "Pankun Sunzen no Funk". The lighter track is still energetic, thanks to the chorus, but it brings down the bombastic funk levels of the entire CD. 15. Panku Sunzen no Funk : The first single from the CD and a good indication of the CD's mood, "Panku Sunzen no Funk" is an upbeat track with electronica, club, and dance influences. It's lost some of the novelty it had when it came out, since it sounds much like what's already on the CD and by the mere fact that it's already been out for a while. 16. Moshimo : A smooth, light ending, "Moshimo" returns squarely to the sample loop. The track sounds very synth, and the trio's harmonies during the are a delight to listen to. After an energized ride, the last track is a great leveling off for the whole CD. And yes, everyone is doing the robotic voice thing, but on this track, it's not nearly as annoying as Cher's attempt. Kick the Can Crew has made their butter on their harmonies and on looping electronica/jazz/dance/bossa nova samples. If that sounds like an interesting mix to you, you might want to catch Good Music and give it a listen. For people already in the know about one of the more popular Japanese hip-hop groups, Good Music is not going to change their mind, as it's not so different from their earlier albums. However, as hip-hop becomes more popular in Japan (even the queen of manufactured pop music, Namie Amuro is in on the act), it remains to be seen if such a "safe" album can keep Kick the Can Crew above up and coming groups like Supercar or Loop Junktion. However, while the album is certainly not as ambitious as Young Kings or Vitalizer, or even Magic Number, Good Music is just that, good music.